You are here: Home / Natural Product Reviews / Reusable Bottles BPA Free for Everyone! Reusable Bottles BPA Free for Everyone! 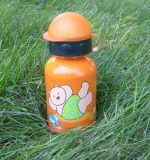 I have dedicated a fair amount of time to exploring safe sippy cups and sports-type bottles for kids on this blog but haven’t really explored the options for mom and dad. Of course it is important that we aren’t sucking down BPA either and having a water bottle around is one of the best ways to ensure we actually drink our water throughout the day. The PET disposable bottles are probably the worst thing we could use. They are single use and add to the waste stream. They also have leaching issues of their own. So what kinda of reusable bottles are out there? Quite a few actually. If we go to the regular store to buy a bottle we need to be on the lookout for one that is stainless steel or made with safer plastics. I usually shop online so I can research my options and there are quite a few. One of my favorite online stores is Reuseit and they have every reusable water bottle out there I think! It is water bottle heaven. 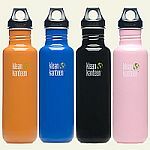 My top pick is the Klean Kanteen! They are uber stylish, easy to clean, and made with stainless steel. My kids have baby sized ones and I have a 27 ouncer. They have the orginal stainless outer finish and the new colored ones that are pretty HOT. They have been extensively lab tested and proven to be 100% free of heavy metals and toxins. The plain ones remind me of camping gear…which I love. I also REALLY like the options they have for caps…flat, loop, sports-top, sippy, etc. I have had mine for around 2 years now I think and it still looks and works great. My kids cups are still going strong too. In the competition for best water bottle in my world is the Intak bottle by Thermos. It is a beautiful polycarbonate bottle with lots of great features like a one push locking top so you can pop the top and drink with one hand. It is see through so you see water levels and it has a loop to attack to backpacks or your belt. It is the BEST bottle for sports, hiking, backpacking, camping, etc. Read my detailed review of the Intak Bottle. I have just added a newer water bottle to my household though and it is pretty comparable to the Klean Kanteen but perhaps a bit more sleek and stylish. It is the ThinkSport Bottle and it is also a bit more like a Thermos with a stainless steel vacuum sealed construction. It keeps contents hot or cold for hours yet it is still lightweight and it has a screen so that you can toss loose tea in there without worrying about choking on tea leaves. :) I am pretty impressed with it but I feel like I am walking around with the Cadillac of water bottles in my hand. It is pretty expensive IMO at $34.00. We also have a Pura water bottle, the pink one in the photo at the top of this post. They are service grade, electro-polished stainless steel, have no chemical liner, they are reusable of course, BPA free, and they come with a lifetime warranty. The lids are stainless steel as well, so that you don’t have to worry about any plastic pieces touching your water. The colors are pretty awesome too. Next up would be Sigg…a bottle made by a Swiss company. These bottles win hands down any competition for most attractive looking bottle. They have a large selection of designs for adults and kids. Apparently they are so poular that many retailers are having a hard time keeping them in stock and the Sigg company is being stingy so that they actually have some to sell themselves! You can find some on Amazon though. These bottles are aluminum with a water based epoxy coating on the inside. While they are very attractive they will get dinged up if you aren’t careful with them. Nalgene is another big seller. These are plastic bottles but they are made with non-leaching HDPE (#2) and LDPE (#4) plastics and they are Bisphenol A free. Some people just prefer plastic. They are not my thing but it is cool that Nalgene is now offering safer options. CamelBak Performance Water Bottles are relatively new ad they are plastic too, albeit a great deal more sporty. They are designed for hikers and sports bikers with a Big Bite Valve and straw that allows access to water without taking your eyes off the trail or road. I like the see-though factor and the cool colors. And of course you may also want an insulated sleeve to keep your beverages at the right temperature. I personally like the Built NY ones. The Klean Kanteens fit perfectly.